"Thrival Geographies," by Amanda Williams and Andres L. Hernandez is displayed in the lobby of the Wrightwood 659 gallery. Courtesy of E. Jason Wambsgans for "Chicago Tribune"
The Chicago Tribune's architecture critic Blair Kamin calls Dimensions of Citizenship's debut in Chicago at the Wrightwood 659 gallery, "a bravely forward-looking exploration of how architecture can express the abstract concept of citizenship." The exhibit, which was commissioned by SAIC and the University of Chicago, was the official entry for the US Pavilion at the 2018 Venice Biennale. Kamin who recently reviewed the exhibit for the Tribune goes on to say that the exhibit is "a very strong show—compact but intellectually expansive, smart and smartly designed, a robust display of visions for a public realm that responds to ever-shifting identities, technologies and circumstances." Although visions of the future remain contested, Kamin notes that "the show isn’t about creating anodyne 'safe spaces' for marginalized groups. Rather, it opens the way for new visions of belonging, which form bracing alternatives to the old-fashioned version of public space that showcases a statue of a general on horseback," thanks to the exhibitors and curators who include Lecturer Iker Gil (Architecture, Interior Architecture, and Designed Objects), Assistant Professor Ann Lui (Architecture, Interior Architecture, and Designed Objects), University of Chicago Associate Professor Niall Atkinson, and Los Angeles-based critic Mimi Zeiger. One of the most compelling displays of the exhibit, according to Kamin, is Thrival Geographies (In My Mind I See a Line), a collaboration bertween Associate Professor Andres L. Hernandez (MA 2004, Art Education), Amanda Williams, and Shani Crowe. WTTW's Chicago Tonight also recently visited Dimensions of Citizenship: Architecture and Belonging from the Body to the Cosmos. The TV segment mentions how the human touch is visible in some of the projects, including Thrival Geographies (In My Mind I See a Line) which uses many handmade braids to explore the concept of citizenship at the scale of the individual. The human touch is also visible in Studio Gang's contribution to the exhibit, Stone Stories, which asks visitors to "consider the civic memory of the ground beneath their feet." Watch the entire segment of Chicago Tonight on WTTW's website. 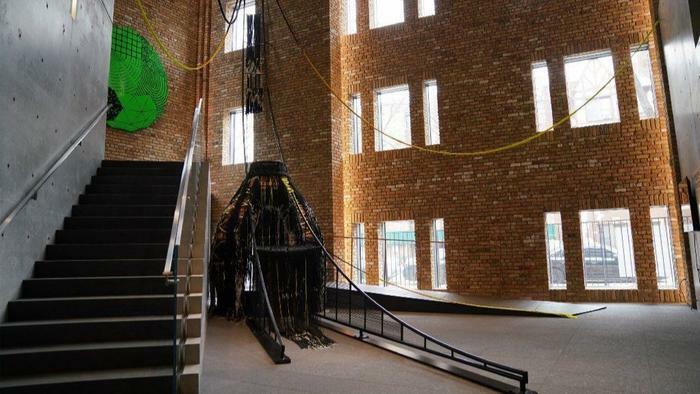 The exhibit was also covered by Architectural Record, which it says "gets off to a materially electrifying start by contrasting the rich Chicago common brick of the original structure with the smooth, velvet-like concrete of Ando’s intervention, and the woven cord of the first citizen-scaled exhibit by Amanda Williams, Andres L. Hernandez, and artist Shani Crowe." In addition Newcity included the Chicago debut on its Design Top 5 list for the month of April and also reviewed the exhibit in its April issue. Dimensions of Citizenship: Architecture and Belonging from the Body to the Cosmos made its US debut at the Tadao Ando-designed space on February 28 and will be on view through April 27.